The army is the main power in the Vikings: War of Clans world, but military might is not enough when it comes to multiplying your riches and conquering the North. 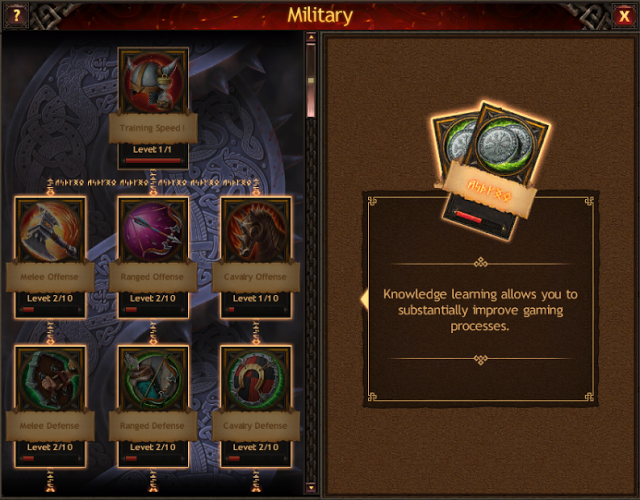 Knowledge lets you produce resources, reinforce the Town’s defenses, improve your troops’ combat ability, and carry out other important processes in the game much faster. Learning Knowledge takes time and effort, but it’s dangerous to neglect your studies. We will tell you about the mysterious Oracle building where the Vikings discover the secret Knowledge of ancient wise men and become experienced and powerful Jarls. By clicking the Oracle, you will open a window with two tabs. 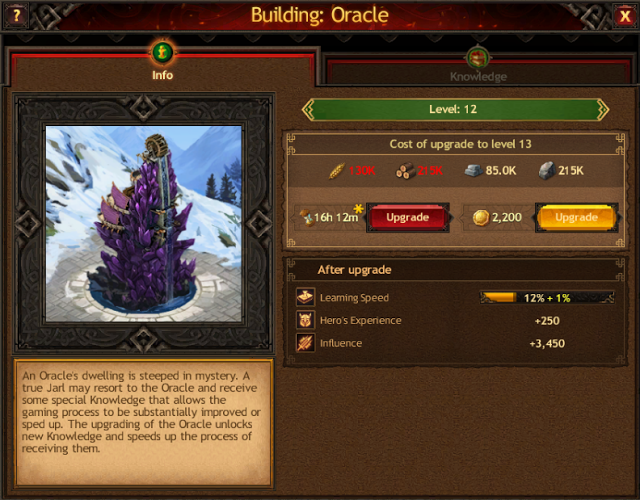 In the first, you can see basic info on the building and building upgrade requirements. The second has all existing categories of Knowledge that you can discover and sequentially upgrade in the future. 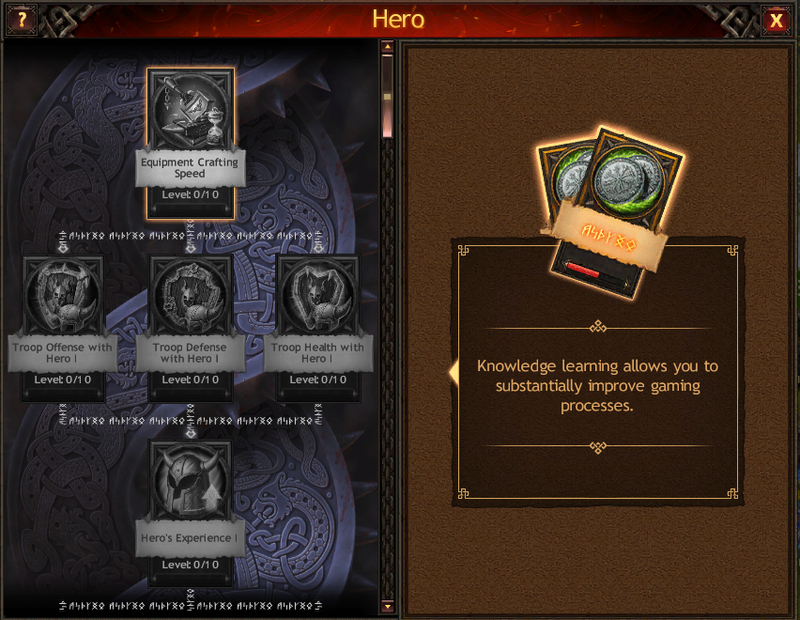 As you can see in the screenshot above, each of the six categories contains a specific amount of Knowledge. For example, the Training category includes 362 Knowledge. Upgrading this Knowledge will take much more time than mastering the 105 Knowledge in the Espionage category. However, regardless of the amount of Knowledge, each Knowledge group is equally important for developing your Town and troops. 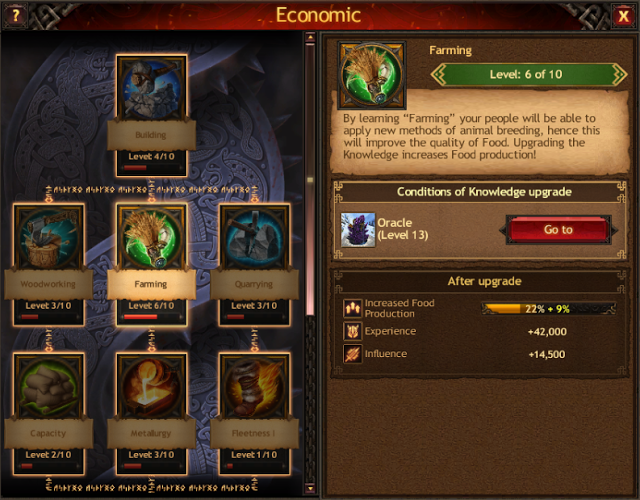 The first category we’ll delve into is Economic. By learning this Knowledge, you will considerably expand your possibilities for building construction and resource production. You can also increase your troops’ fleetness and capacity in attacking resource locations and supply your Town with everything you need, winning valuable trophies in the process. The next category is Military. This category of Knowledge will let you improve your troops’ battle characteristics. Additionally, by mastering the Military category, you will be able to unlock new tiers and train stronger warriors that will considerably increase the strength of your army. The Espionage category is highly important for Jarls who strive at all costs to overcome obstacles on the path to the victory. Scouts protect the Town from espionage and obtain secret information about opponents. By mastering the Knowledge in this category, you can unlock new tiers of Scouts, reduce training costs, and improve espionage battle characteristics. 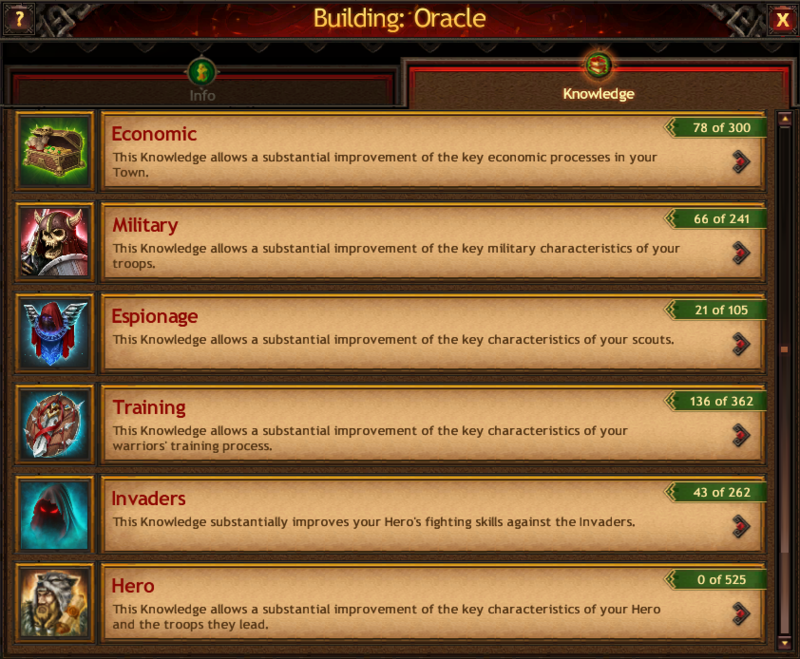 The fourth category of Knowledge in the Oracle will help you to cut the cost and time of training warriors and also strengthen your troops significantly. 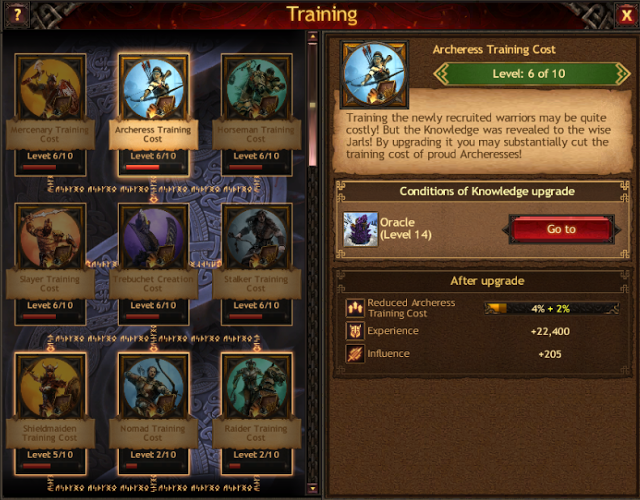 The Training category gives you a substantial advantage over your enemies and lets you train warriors more effectively and less expensively. This category of Knowledge contains all the mysteries of the cunning Invaders attacking your Kingdom. 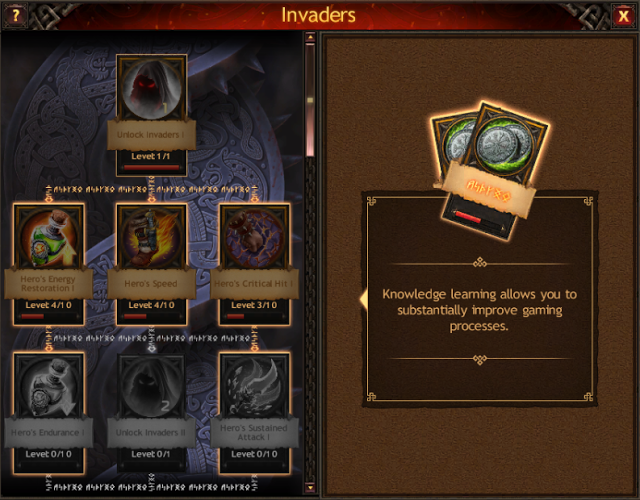 By learning the Knowledge in the Invaders category, you’ll be able to improve the characteristics of the Hero who opposes this menacing threat, and fight back the most dangerous foreigners, gradually gaining powers and unlocking the attacks of higher-level Invaders. This category contains Knowledge that improves the characteristics of the troops led by the Hero. These troops will be much stronger, their health and defense characteristics will increase, and the enemy army will be weakened. Learning Knowledge is a hard and important task that only true Vikings can manage. Improve your Knowledge in the Oracle, and the ever changing world of Vikings: War of Clans will be yours to subdue! Play Vikings: War of Clans NOW!